When you go to theatre as much as I, you learn there are a number of adages. The first is that the perfect subscription season is rare. There is typically one clunker that you need to endure because you’re that interested in the rest of the season (and, admit it, watching a well-orchestrated train wreck can be quite entertaining). Another is that, with musicals, sequels never work. From Annie 2/Annie Warbucks to Bring Back Birdie to The Best Little Whorehouse Goes Public to even A Doll’s Life — they seem to be doomed to failure (there’s only one successful musical trilogy, of which the latter two-thirds became one musical, Falsettos, also this is a little less true for actual plays, where sequels (Clybourne Park), trilogies (the Eugene Trilogy), and even longer sequences are successful). These two adages came together Saturday night at the Hollywood Pantages (FB), when we had our series subscription tickets to Love Never Dies, with music by Andrew Lloyd Webber (FB), lyrics by Glenn Slater (FB) (and additional lyrics by Charles Hart), based on a book by Ben Elton, which in turn was based on the book The Phantom of Manhattan by Frederick Forsyth. Love Never Dies is the sequel to the blockbuster Phantom of the Opera, taking place in 1908, ten years after the events in Phantom (which occurred in 1881). Don’t sweat the math. They didn’t. As usual, this writeup will go in my usual order: my thoughts on the plot and the book (including a synopsis), then we’ll look at the acting and the production/creative teams and aspects. Hint: Those latter two aspects were good. As for the first, let’s just say you can use the number two in a different context. Love Never Dies moves the action to America and the carnival that was Coney Island at the turn of the 20th Century. The Phantom, having escaped/faked his death in Paris, has been smuggled to the US by Madame Giry (the balletmistress in Phantom), and set up in a Phantasm carnival together with Mme. Giry’s daughter, Meg. Meg is hoping to get the Phantom’s attention and affection, but he is still pining for Christine Daaé (his object d’obsession in Paris). But — surprise of surprise — he learns Christine and her husband, Raoul, Vicomte de Chagny are coming to the US to sing at the request of Oscar Hammerstein. So guess what happens? Yup, he arrives first, squirrels them off to Phantasma at Coney Island, and then begins to haunt and pine. Christine and Raoul have brought along their son, Gustave, who is just about 10 years old (you do the math — see the first paragraph), who wants to see Coney Island. I think you can see the various triangles that have been set up. I will note that at the end, I turned to my wife and said: Part III – My Two Dads, as the Phantom and Raoul raise Gustave. It’s just so — today. If you want a more detailed synopsis, read the Wikipedia synopsis of the 2010 Australian version, as that’s the version on tour. This production has not been on Broadway. It was about to go when it first left London, but critical reaction there led to a retooling. This led to the Australian version, which as marginally more successful. That’s what’s on tour, and rumor has it that it won’t be going to New York. As for cast albums, what is on Amazon is the Original CONCEPT Album, and many songs there have been tossed or rearranged (per a great interview with Glenn Slater on Broadway Bullet). The tour is selling the Australian Cast album for $35 (ouch), and it isn’t available elsewhere. So what did we think of the show? First, if you are a Phantom lover, what we think doesn’t matter. Phantom lovers will ignore the story, love the performances, love the romance (and no, you can’ use that as your pull quote) and be completely teary eyed at the end. They will be happy, as will much of the blithely unaware Pantages audience that only knows the spectacle and doesn’t think much further. As for the rest of us…. I tried to look at this show from a number of levels: First, how well did it stand-alone (i.e., how much context was required)? Second, did I enjoy the show? I’ll note that I’m not an ALW fan, but I’m not an ALW hater either. I quite like Evita, and I’m looking forward to School of Rock, which is from the same team. I think Cats is a spectacular dance show. I don’t like Jesus Christ Superstar, but that’s because I’m Jewish and it just gives of an antisemitic vibe. But I could never get into Phantom. I saw it ages ago. I never saw the romance in the show; the memory it left was something deep and ponderous, with a few songs that become earworms and a few good novelty songs. I truthfully didn’t remember the characters. So as to the first question: Not remembering the characters, I found that I was lacking the backstory that would make Love Never Dies instantly accessible. There were relationships and clues and passions that I just couldn’t glom onto because I didn’t know them. The opening exposition was inadequate to draw the audience into that context; there wasn’t anything in the program to provide that context. For a sequel to work, this is a problem. The show must not require seeing something else first in order to understand what is on stage. The storytelling twists itself into knots trying to make the Phantom less icky, most notably by attempting to convince us that Christine was more enamored of him in the first musical than we might have suspected. Still, with the tale barely underway, the Phantom not only abducts Christine once again, but her family as well. He later flies into a rage with Christine, then begs forgiveness. And once he meets the musically precocious Gustave, he develops a worrisome fixation on the boy as well. The Phantom’s behavior is exactly what #MeToo is calling out right now. Moving past the wrong direction of the storyline, there is the basic Phantom style itself, which comes across as melodrama: overplayed for the sympathy, perhaps to hide that there’s really nothing there. If you think in terms of character changes from the events in the story, who has changed? The Phantom? Hardly. His behavior hasn’t indicated he learned anything at all from his behavior during the show. Christine? Nope. Raoul? Again, he’s not a better dad, and there’s no evidence he gambles less. Meg? Unclear. No one really changes. They are the same wretches we saw at the beginning. I’m not sure there was a particular point being made through this story. Further, after rereading the synopsis of the original show, the central catalyst incident for this entire show might not even have happened at all. You need to suspend your disbelief in that one incident. If you’re a romantic Phantom fan, you can. The rest of us? So the book, in general, just does not work, and probably cannot be made to work…. unless they decide to focus on the portion of the story that is of interest: a story that takes place in a circus in Coney Island in 1908, and just jettison the characters from Phantom. Create new characters that we care about, and let the story change them from living in this environment. Perhaps that was done already with Side Show? As with Phantom, the music consists of a number of melodies, repeated and repeated (and repeated and repeated (and repeated and repeated (and repeated and …)))). There are a few good novelty musical numbers, but it is telling when the circus sideshow numbers and circus leaders are much more interesting than the primary leads. I know that ALW and Slater can do better — I’ve heard the cast album of “School of Rock”, and it is great — and from ALW and Slater. This was written in the ponderous and dark style of the original Phantom. Luckily, we were at an open-captioned performance, so I could actually read what that characters were saying. So, besides the book and the music, did I enjoy the show? I’m pleased to say that, aside from the story, the performances themselves were great. I’d like to start not with the leads but the first three performers we see on the stage: Fleck, Gangle, and Squelch, portrayed by Katrina Kemp (FB), Stephen Petrovich (FB), and Richard Koons (FB), respectively. These were extremely unique performers (particularly Kemp, who is a little person), unlike what you see on the stage today — more appropriate to Cirque de Soleil. As such, your eyes were drawn to them whenever they were on stage. They sang strong from the opening “Coney Island Waltz”, and moved strong, but most importantly, they created the sideshow environment that characterized this show. As the rest of the ensemble joined them, you were drawn to the wide variety of shapes and portrayals and talents. It was this troupe that actually made the show as spectacular as it was. Of course, that’s not what the Phantom Romantics will say. For them, it was Gardar Thor Cortes (FB)’s Phantom, and Meghan Picerno (FB)’s Christine that were the stars. It is true they had spectacular, operatic voices that were a joy to close your eyes and listen to. Their execution on their numbers such as “‘Til I Hear You Sing” or “Love Never Dies” — the first time you hear them — is lovely. They showed romance and passion. But to me, the Phantom was cape and flash, a two-dimensional and wooden portrayal. I don’t think that is the actor — I think that’s the writing and the idea, and yes, an extension of how the Phantom was in the original. Picerno’s Christine had more flashes of spirit and light, but was ultimately too operatic in her performance to capture the character as fluid. The next tier of characters, Sean Thompson (FB)’s Raoul, Mary Michael Patterson‘s Meg, and Karen Mason (FB)’s Mme Giry, were much more spirited. Thompson captured Raoul’s cad aspects quite well, and Patterson’s Meg was just a delight to watch (especially in the Bathing Beauty scene). Mason captured the evil expression of Mme Giry, while not turning her into quite a caricature villain. All sang strongly. I particularly enjoyed Thompson in “Devil Take The Hindmost” and Patterson in “Bathing Beauty”. A big surprise was Jake Heston Miller (FB)’s Gustave (he alternates with Casey Lyons (FB)). Miller was a very strong performer, with a lovely voice and great expression. Rounding out the cast were the members of the ensemble: Chelsey Arce [Asst. Dance Captain], Diana DiMarzio (FB) [u/s Mme Giry], Tyler Donahue (FB) [u/s Gangle], Yesy Garcia (FB) [u/s Fleck], Tamar Greene (FB), Natalia LePore Hagan (FB), Lauren Lukacek (FB) [u/s Mme Giry], Alyssa McAnany (FB) [u/s Meg Giry], Rachel Anne Moore (FB) [Christine-Alternate], Bronson Norris Murphy (FB) [Phantom-Alternate], Dave Schoonover (FB) [u/s Phantom, u/s Raoul, u/s Gangle], John Swapshire IV (FB), Kelly Swint (FB) [u/s Meg Giry, u/s Fleck], Lucas Thompson (FB) [u/s Squelch], and Arthur Wise (FB) [u/s Squelch]. Swings were Erin Chupinsky (FB) [Dance Captain], Alyssa Giannetti (FB) [u/s Christine], Adam Soniak (FB), and Correy West (FB). Additional understudies were: Michael Gillis (FB) [u/s Phantom, u/s Raoul]. As I noted earlier, the ensemble was strong and a joy to watch. If you are close enough (or brought your binoculars), watch their wonderfully expressive faces. The production was directed by Simon Philips, and choreographed by Graeme Murphy AO. Together, these two are responsible for the second great part of this show: the staging and movement. Irrespective of the weak book, the movement and spectacle on the stage was a joy to watch. From magical movement and circuses to mermaids in a box, from the large and the small, the visual aspects were quite strong and distracting from the weak book. But not quite enough. Thirdly, the music of the show, as one would expect, was quite lush. Credit here goes to the music director, Dale Rieling (FB), and his orchestra: Eric Kang (FB) [Asst. Conductor, Keys 3]; Dominic Raffa (FB) [Keys 1]; David Robinson (FB) [Keys 2]; Dmitriy Milkumov (FB) [Concertmaster]; Hector J. Rodriguez (FB) [French Horn]; Gary Cordell (FB) [Trumpet]; Ric Becker (FB) [Bass Trombone, Tuba]; Aaron Nix (FB) [Percussion]; Grace Oh (FB), Jen Choi Fisher (FB), Lesa Terry (FB), Ina Veli [Local-Violins]; Karen Elaine, Jody Rubin [Local-Violas]; Ira Glansbeek [Local-Cello]; Sara Andon [Local-Reed 1]; Richard Mitchell [Local-Reed 2]; Jeff Driskill [Local-Reed 3]; Judith Farmer [Local-Bassoon]; Michael Valerio [Local-Contra Bass]; and Steve Becknell [Local-French Horn]. Other music credits: Stuart Andrews [Keyboard Programmer]; Eric Heinly [Local Music Contractor]; Kristen Blodgette [Music Supervisor]; David Lai and Talitha Fehr [Music Coordinator]; David Cullen and Andrew Lloyd Webber (FB) [Orchestrations]. Lastly, there is the creative and production team, and the miraculous sets by Gabriela Tylesova (who also designed the costumes). Again, here the circus aspects win out. The leads costumes were what you would expect, suits ties and fancy dresses. The circus performers, and the world they lived in, was just magical. This was assisted by the wig and hair design of Backstage Artistry. Nick Schlieper‘s lighting design established the mood well, and Mick Potter‘s sound design was adequate in the cavernous space that is the Pantages (although the open captions helped quite a bit). Other production credits: Edward Pierce [Design Supervisor]; Randy Moreland (FB) [Technical Direction]; Tara Rubin Casting and Lindsay Levine CSA [Casting]; Anna E. Bate [Production Manager]; Karen Berry [General Manager]; Aaron Quintana [Company Manager]; Daniel S. Rosokoff [Production Stage Manager]; Gavin Mitford [Associate Director]; Simon Sault [Associate Choreographer]; Eric H. Mayer [Stage Manager]; and Lauren Cavanaugh [Assistant Stage Manager]. Love Never Dies continues at the Hollywood Pantages through April 22. Discount tickets may be available on Goldstar and other outlets. If you love Phantom or are an ALW completeist, this is worth seeing. As for the rest of you, save your funds for School of Rock. 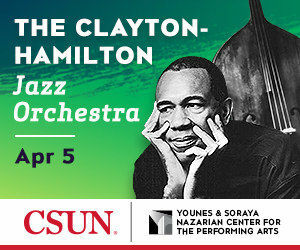 Note: Two days before this, we saw the Clayton-Hamilton Jazz Orchestra at the Saroya [the venue formerly known as the Valley Performing Arts Center (VPAC)] (FB). This was a concert of big band jazz, and I didn’t write down a set list. So there’s isn’t a formal review, other than to note that this is another great big band jazz group with CSUN alumni (others include Big Bad Voodoo Daddy and the Big Phat Band). We enjoyed the show quite a lot. Next weekend brings A Man for All Seasons” at Actors Co-op (FB). The third weekend of April brings Bad Jews at The Odyssey Theatre Ensemble (FB) on Friday, followed by The Hunchback of Notre Dame at 5 Star Theatricals (FB) (nee Cabrillo Music Theatre (FB)) on Saturday. The last weekend of April sees us travelling for a show, as we drive up to San Jose to see friends as well as Adrift in Macao at The Tabard Theatre Company (FB).